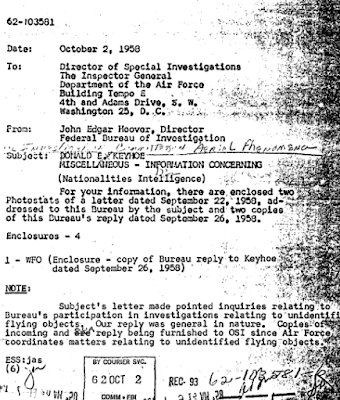 Im getting alot of emails from people who have gone over the FBI's recent files release on Ufos. There is some really interesting stuff in the Vault and if you have time check the files out yourself. It seems that former FBI chielf J Edgar hoover, had involvement in the governments Ufo investigations, particularly during his time as head of the FBI in the 1950's. If you have gone over the files please reply to this post or email me any areas of interest. It's not Thursday April 14th if you live Europe. As for the documents from the FBI, my opinion is that it's a precursor to something much bigger that's about to take place. However there is always that lingering feeling that it's just another white wash of disinformation. What makes it really hard to decide is for either one to work, disinformation or yes it's all true they've been here all along (extraterrestrials), the mega corporate mind control media would need to drive it to the masses who have no idea there's even a debate about whether extraterrestrials are real or not.